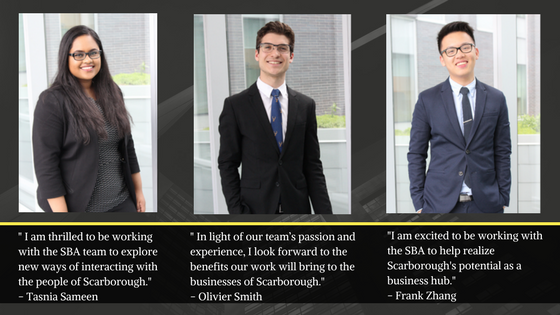 Three student interns have joined The Scarborough Business Association to broaden their experience of working in a professional business environment. Tasnia Sameen, Olivier Smith and Frank Zhang are students from the University of Toronto hired as marketing and communications coordinator, economic development researcher, and research analyst respectively. “Made possible through the Canada Summer Jobs program, the SBA is thrilled to employ three students this year. Each student has unique roles in marketing, economic development and research and function as a junior consulting group in pursuing shared association objectives.” said President of SBA, Roger Francis. As the marketing and communications coordinator ; Tasnia will develop a strategy to improve the flow of communication between the association and the community of Scarborough through various marketing campaigns and by enhancing the presence of the company on different social media platforms. The goals of the economic development researcher; Olivier is to identify opportunities for economic development and find means through which higher employment in Scarborough can be achieved. He will facilitate the development of an economic opportunity plan including visions goals and objectives and consolidate his findings and recommendations into a tangible report. The research analyst ; Frank is responsible for identifying programs, tools and resources for the use of the business community. He will collect data and analyze municipal statistics and industry landscape data. He will also lead the early development of a database that maps out Scarborough businesses. The Scarborough Business Association supports businesses in Scarborough through networking, business education and identifying opportunity for the Scarborough business community. Posted in education, networking, opportunity and tagged business, opportunity, Scarborough.